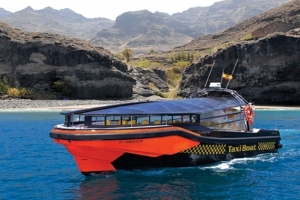 Enjoy the sea on board the Elsie One, a luxurious catamaran up to 12 Passengers, sailing throughout the coast of Gran Canaria, with a variety of typical canarian meal with a variety of wines to pair the meal with (also available Vegetarians and Gluten Free dishes with pre-booking). Make the most of our unique Fun on Board program, including activities such as Kayaking, Snorkelling, Sub-aquatic Photography, Paddle Surf and our Air Mattress at no extra cost. 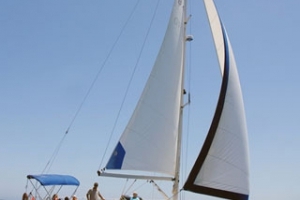 If the weather is suitable, we will raise our sails!. 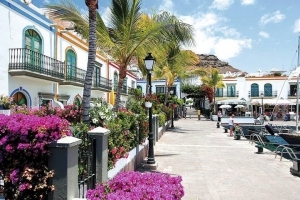 Your best vacation day at Gran Canaria. 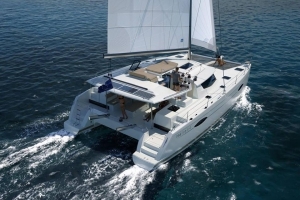 Have a brand new Catamaran just for you and your friends and family. 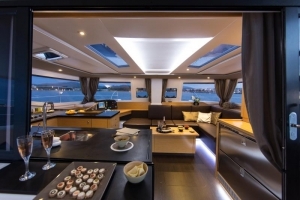 With the private charter we will taylor make your Cruise, from choosing your desired meal to the route to be sailing through. Our solariums and terraces are the ideal spot for your entertainment. All activities, food and beverage are included. Enjoy the sunset on board the Elsie One, an unforgettable cruise which will take your breath away. 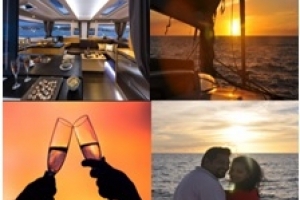 Drink champagne with chocolate covered strawberries on our top deck whilst observing how the sun disappears on the horizon, painting a picturesque colour palette on the sky. Drinks and Snacks included. If you love whales, dolphins, the sea and the beaches hop on board for a breathtaking experience on the open ocean. We head from Puerto Rico out to the open sea to search for dolphins and whales. Then we go to one of the beaches like Maspalomas or Gui Gui where we have a bath. After this refreshing break, we go along the coast back to Puerto Rico. Tuesday, Thursday, Friday & Saturday. 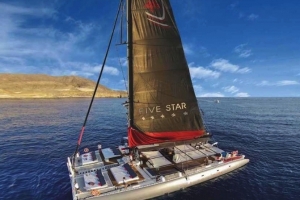 Five Star Boat Gran Canaria, spectacular catamaran with a capacity for 150 people, equipped with 15 Balinese beds for you to enjoy an excursion with the utmost comfort around the Southeast coast of the island. 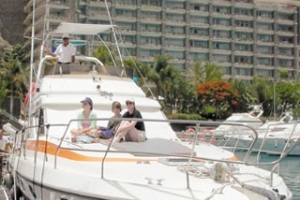 Enjoy the onboard bar, barbecue, snorkel equipment, great discounts on other water activities. Departure from Puerto Rico. 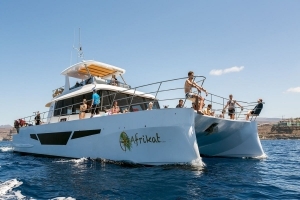 Enjoy a 5 hour excursion on Afrikat Catamaran. Includes buffet meal and drinks. Snorkelling equipment included. Water sports at discounted rate. Transfer Included. A perfect family day out- enjoy a 5 hour boat trip including snorkelling and banana boat as well as visits to secluded marine caves. Food and drinks included. 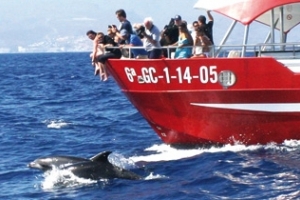 After our normal 2 hour dolphin and whale search, this excursion will continue to Puerto de Mogán, the little Venice of the Canary Islands where the guests will have time to go for a walk or shop in the famous Mogán Market. 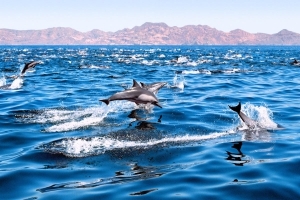 Enjoy a 2 hour dolphin-watching trip onboard a catamaran where you’ll have the chance to see these beautiful creatures in their natural habitat. Drinks and transport included. Monday, Tuesday,Wednesday Thursday, Saturday & Sunday. 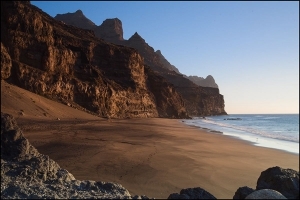 Aproveche para disfrutar la experiencia del avistamiento de cetaceos en Gran Canaria. 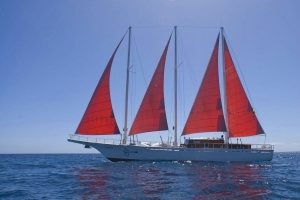 Un plan perfecto para que niños, jóvenes y adultos puedan vivir una maravillosa experiencia con los cetáceos en el océano abierto. Desde Puerto Rico se dirige alta mar en la búsqueda de delfines y ballenas. A continuación se navega a la playa escondida de Gui Gui para tener un baño. Después de este refrescante paseo se vuevel a Puerto Rico paseando por la costa. Bebidas y Snack incluidas. Duración 3.5 horas. 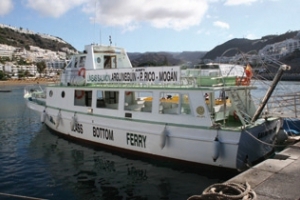 Arrive in style for a fresh fish lunch in the fishing harbour of Arguineguin or enjoy a fun day out in Puerto Rico with the Blue Bird Ferry or Líneas Salmón. 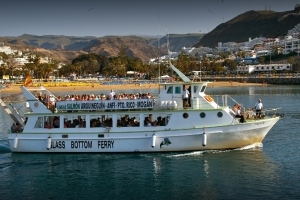 Leave the car and buses behind and take the most scenic and relaxing route to Mogán’s Harbour on this daily ferry service. 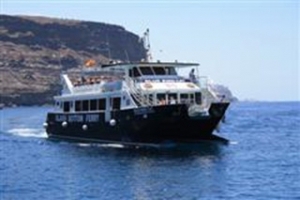 Feel the wind in your hair as you take in the beauty of the Gran Canaria’s southern coast.Discover sea caves and deserted beaches aboard the sailing boat Fuerza 7. Maximum 7 people. 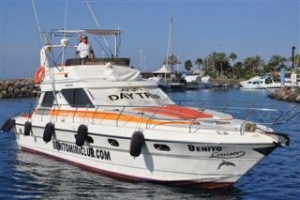 Feel the excitement as you ride the waves on a boat trip around the island aboard the Benito Cruiser motor-boat. Maximum 12 people. Crew and food included. 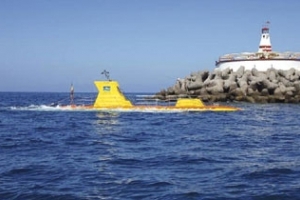 Discover the wonders of the ocean bed around the south coast of the island during a half-day excursion to Mogán’s Harbour on board a real submarine.